Secular Pro-Life Perspectives: January Plans! It's November first, and you know what that means: it's time to make your plans for all the Roe v. Wade anniversary protest events happening in January! The March for Life in Washington, D.C.
As we have done every year since our founding, Secular Pro-Life will join the hundreds of thousands of pro-life advocates marching down the National Mall to the Supreme Court in the March for Life. This event memorializes the millions of innocent lives lost to abortion as a result of Roe v. Wade, which the Court handed down on January 21, 1973. It sends a message to the Court, and to our elected officials, that we will not back down until the right to life is restored. And it is an opportunity for us to connect with one another, building relationships that will help us save lives together in the coming year. 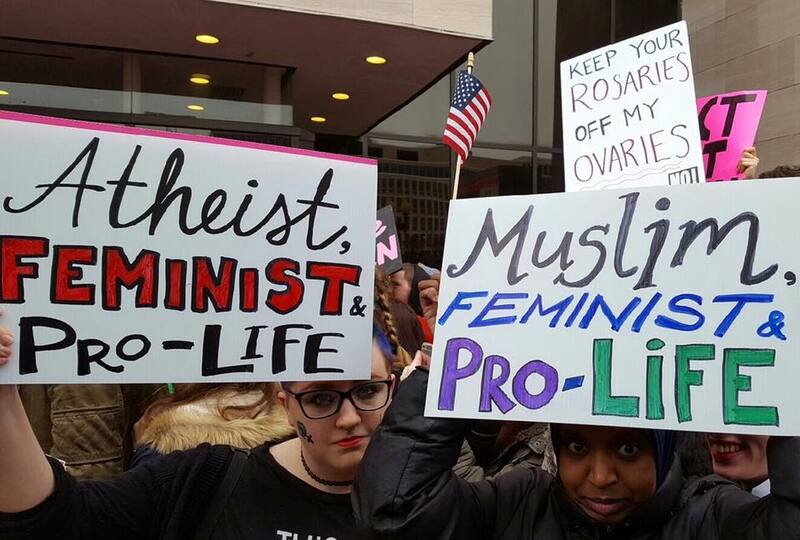 Of course, we will carry our giant, bright-blue, can't-miss banner that says "Secular Pro-Life: For the embryology textbook tells me so." Stay tuned for details about our meet-up location. The Cardinal O'Connor Conference on Life in Washington, D.C. This is a Catholic conference, and we've never been before. The 2018 theme is "(Ir)religiously Pro-Life: The Future of the Movement in a Secular World," and the conference organizers personally reached out to us to ensure that our voice is heard. We're excited to share our perspective with Catholic allies. Secular Pro-Life has always loved the SFLA conference; it's a great opportunity to equip campus pro-life leaders with the tools they need to reach diverse audiences. We do have enough volunteers to exhibit at both the SFLA conference and the O'Connor conference simultaneously. Unfortunately, money is tight, and the price of an SFLA conference exhibit booth has gone up. If you want to see us at the SFLA East Coast Conference, please make a donation to help cover our expenses. Your generosity is greatly appreciated! The Walk got started as an alternative for those who couldn't travel all the way to Washington, D.C. for the March for Life, but has blossomed into a fantastic event in its own right. Stay tuned for meet-up details. This is the smaller and less expensive of SFLA's two conferences, and we will definitely be there. Come by our booth for free SPL literature you can use on your campus, and learn about our exciting upcoming projects! If you can't make it but support what we're doing, please consider a donating to help us through our costliest time of the year. Thank you for your support! Aborting to get a guardian angel? Will Artificial Wombs End the Abortion Debate?